A dog can cause much disturbance and irritation in your neighborhood if he can’t stop barking all day long. You can resolve this problem for your furry friend’s excessive barking with Our K9 Bark Collar He barks at the cats, at the mailman, people walking outside, and passing motorcycles, and yet he doesn't show any sign of improving his behaviour at barking everything. This is why we took commitment to provide a pet-friendly collar that correct this barking problem your furry friend has — and Our K9 Bark Collar was born. What makes this anti-bark collar special is that it was designed to teach your pet self-control, with safety and protection in mind. It’s very easy to use and comes with equipped with cutting-edge technology that is safe and comfortable to wear on your dog’s neck. What’s In The Box? 1 x Anti-Bark Device 1 x USB Charging Cable 1 x Nylon Belt 1 x Free Clicker 1 x USB Access Key 1 x User Manual Hassle Free Recharging! You no longer have to go to the market to spend money for batteries that will dry out after a while. Designed with your utmost convenience in mind, you can charge the anti bark collar via USB charging port. You can charge on your laptop, desktop, power bank, GPS and more. That’s what makes our no bark collar the BEST choice for pet owners. The collar is fully adjustable to fit snugly on your dog’s neck. Just place it around and secure the collar so you don’t have to worry about coming off loose. It’s waterproof, dust-proof, and solid for long lasting durability. Guaranteed! Remember, we’re here to improve your dog’s behaviour and keep calm and quiet. If any one of those things isn’t happening, let us know and we promise to make it right. DON’T WAIT? TRAIN YOUR DOG AND CORRECT HIS BAD BEHAVIOUR BY CLICKING THE ADD TO CART BUTTON NOW! RECHARGEABLE BATTERY: This bark collar has a rechargeable battery with high function. The battery requires 4 hours charge to fuel 10-day function. No need for replacing batteries. With the Rechargeable Bark collar your always on the go. SOUND BEEP - VIBRATION: This collar for small and extra small dogs used beep and vibration features. For warning, a beep sound is initiated and for bark training vibration is used. 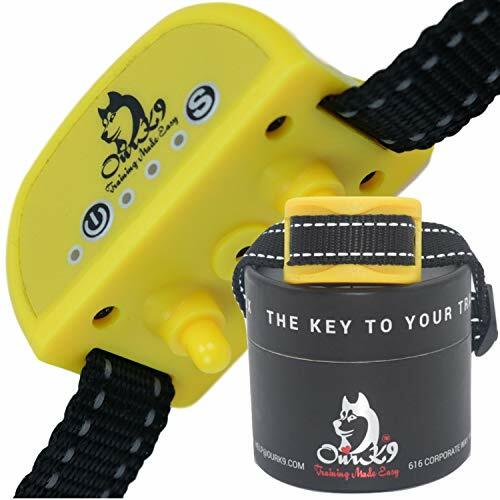 This beep dog collar is best for dog safety and training. ADJUSTABLE COLLAR: The Vibration Bark Collar is adjustable and any fitting size from x-small to small can be achieved around the neck. The Bark Collar is designed to give your pet extra comfort, your dog will get used to it and love it in no time. INCREASED SENSITIVITY AND SAFETY: The product is designed with extra care on the safety of your pet. Automatic Safety Control and Shut Down option is installed. This Vibration Bark Collar has high accuracy due to 7 layers of sensitivity. If you have any questions about this product by Our K9 Training Made Easy, contact us by completing and submitting the form below. If you are looking for a specif part number, please include it with your message.